Our brains felt jangled by the time we arrived at the sand spit. The roads along this coast are littered with some huge potholes. More aptly put, the potholes you drive on occasionally have some flat bits. With the light fading, beautiful jade green water and an orange sunset it felt incredibly fishy. Fishy water, a stunning sunset and a fresh tropical breeze. What more could you ask for? The prevailing wind on this Mexican coast is decidedly leftist, coming head on and into the left hand. This evening was no different and with the wind pumping and standing in the surf without a basket meant I was limited to fishing pretty close in. Working my way up the beach with a 1/0 silicone mullet I had picked up a couple of little snapper and small jacks. On a calm day I would love to fish a small Clouser on a 4 weight for these little guys, but today I was hoping for something bigger. Seeing a dark patch in a jade green piece of water about 20 m out I put out a cast expecting to pick up at least a snapper or reef species that called the coral tower home. One strip in and my fingers were literally smoked with the handle whacking them goodness knows how many times before I could react. Not quite sure what was happening, I cranked up the drag and starting following down the beach as backing zipped off, at astonishing speed. Once the chaos of the first two runs was tamed, it became a nervy tug of war with the fish moving away parallel to the beach. My mind was just waiting for that dreaded slack feeling of a knot failing, coral cutting things short or the hook simply popping out. It happens in my dreams often enough. 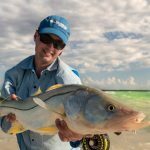 This was not helped by the rookie mistake of only having a 23 lb fluorocarbon tippet, which is what I had rigged up earlier for any permit making an appearance on the flats. I don’t believe I had high hopes of landing this beast, but today was my lucky day and I would not be regretting the mistake of underestimating the size potential of these waters. Everything held and after about 8 minutes and 300 m up the beach from where I hooked it, I tailed a magnificent Jack. I did not need to cast again that day, the fishing bug was content, happy and savouring a very special sunset. The fishing bug was back with a vengeance the next morning and this time the plan was to work the surf along a sand beach searching for bones and permit. With the 8 wt I blind fished the surf with a small tan Clouser and had my 10 wt rigged once again with a tan and white silicone mullet, but now with 35 lb fluorocarbon. After the first 2 hours I had nothing to show and was debating whether or not to cut my losses and head back to the coral flats in search of bones and triggers. But I decided to walk a km or so and see if there were any features or fish I could spot in the waves. I came across a shallow sand bar extending out and a number of needlefish visible. It turns out that these are actually great indicator species and usually I found bone action wherever these were present near a good sandy area. Having hooked and lost a needlefish during the ensuing acrobatics, I decided to some blind casting with a 1/0 chartreuse over white Clouser. Not two casts in some feisty little fish nabbed it and turned out to be a little bonefish. The bonefish were feeding in and about the surf zone where sandy areas extended out a bit. This little bonefish was the first, taking a ‘large’ 1/0 Clouser casting blind in the surf zone. 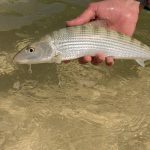 Confidence was now buoyed and knowing that they were about, I switched to the all-conquering tan over white Clouser in a smaller size, which started picking up little bonefish with almost metronomic frequency. I lost one larger fish that ran out a good amount of line, but most fish were small and the 8 wt felt a bit over-powering. When it got quiet in an area, I’d simply move a few meters down the coast and start again. They were feeding right in the surf zone and were very aggressive. The bones I found in the surf were very plentiful but all small. A 6 wt would be perfect for them, although it was almost always windy. 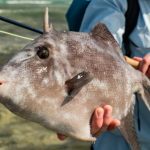 While merrily picking up bones, a darkly coloured massive hulk of a fish with the unmistakable outline of a permit appeared suspended in an emerald green wave about 25 m out. This was a trophy. Now for the second rookie mistake…My 10 wt now had a silicone mullet attached, not a large Merkin or Kwan. And my 8 wt had a measly little tan Clouser. I decided that the tan Clouser had a better chance than the mullet, and proceeded to wade out, strip off line and make a cast as quickly as I could. It was not to be and instead I landed about 5 m too short behind the fish, as it was moving away from me. Like a giant submarine it slowly disappeared behind the next wave and out of sight. Next time I vowed to have a large Merkin tied on instead, which I was pretty sure a jack would eat too. As Murphy’s Law would have it, a few days later a good jack put in an appearance and proceeded to happily ignore the Merkin as it raced over a sand flat. Perhaps I need to carry three rods? A little airtime for Cpt Jack! Very cool, Gerald. Thanks for sharing. That sunset jack must have been a rush! I have been eyeing out a Yucatan trip for some time now. Mind if I grab your email address and drop you a mail to pick your brains a bit?